In local-regional hyperthermia, the heat is only directed regionally and straight to the tissue or organ affected by the tumor. This is in contrast to whole body hyperthermia, where the entire body undergoes excessive heating. 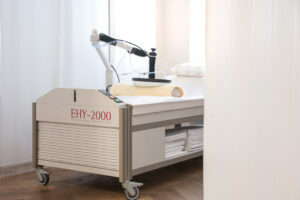 At St. Georg Hospital, local-regional hyperthermia is offered in two different forms, deep hypertermia and surface hyperthermia. How does local-regional hyperthermia work? The region of the body affected by the tumor is positioned between two applicators. Under the physician’s supervision, radio waves are then concentrated, computer-controlled, to the tumor or tumor bed. The temperature is raised and maintained in the tumor tissue for approximately 60 to 90 minutes. A temperature check is carried out either directly in the tumor or from outside using a radiometer which, unlike invasive temperature monitoring, carries no risk of infection and tumor cell dislocation. Heating the tumor tissue also affects adjacent healthy tissue. However, this readily dissipates the heat by increasing the circulation. The impaired blood supply in the tumor tissue ensues in inadequate heat regulation, therefore an increasing heat in the tumor tissue starves the tumor cells of oxygen and nutrients. This in turn results in impairing the metabolic process of cell division and maintenance. The repair systems of the cancer cells also fail and the heat-damaged cell components (membranes, proteins) are not replaced, which leads to the death of tumor cells. Furthermore, research has shown that cancer cells, unlike healthy tissue, when heated to approx. 42°C (106.8°F) form characteristic protein structures on their surface. These protein structures (e. g. -HSP 72), also known as heat-shock proteins, activate the natural killer cells of the body’ s own defense mechanism to attack the tumor cells. Hence, hyperthermia works not only by heat destruction but also by stimulating the immune system. We call this form of hyperthermia with radio waves and electro-magnetic field Oncothermia. Which diseases are treated with local-regional hyperthermia?